How did the coming of the railroad affect economic changes in the Las Vegas Valley? 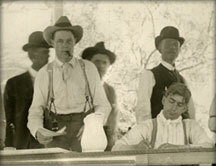 Southern Nevada at the turn of the century found itself at a crossroads of national and regional developments. While Southern Nevada was awash with gold, silver, and other minerals, it took the emergence of a national system of transportation and national markets to capitalize those ore deposits, and by so doing vitalize what was an arid and sparsely populated region. Three developments occurred that together made Southern Nevada and the town of Las Vegas viable. First, the discovery of massive gold and silver deposits in Tonopah, Goldfield, and the Bullfrog district made the region attractive to miners and investors. Additionally, with the rise of the fruit growing and agricultural industry in Southern California, as well as the consolidation of the western railroads, most critically the Union Pacific Railroad under the dynamic leadership of E.H. Harriman, came the need for a more efficient transportation system in the region. Harriman and his Union Pacific Railroad, through its various regional subsidiaries such as the Oregon Short Line, needed a terminus for their transcontinental system on the west coast. Excluded from San Francisco, already the dominant western port, Harriman and his chief rival in the southwest, Collis Huntingdon of the Southern Pacific Railroad, both maneuvered for control of Los Angeles. Huntingdon, while he was alive, successfully used his considerable influence in California and Washington to block any railroad from developing San Pedro, with its system of local railway lines, as a viable port and terminus that would compete with the Southern Pacific. Huntingdon died in 1900, leaving the powerful Southern Pacific Railroad in limbo just when Harriman was consolidating his Union Pacific system. Harriman, in an unexpected and bold move, acquired the Southern Pacific Railroad, removing any obstacle to his extending the lines from Ogden through Nevada to Los Angeles and San Pedro. But while Harriman was preoccupied with the Southern Pacific deal, William Clark—Montana copper baron, U.S. Senator, and one of the wealthiest men in the United States—made a bold move of his own by acquiring the Los Angeles Terminal Railroad with its harbor property at San Pedro and incorporating a new railroad company to run a line from San Pedro across Nevada to Salt Lake City. Unlike Harriman, Clark was not primarily a railroad man, and his interest was not in running a railroad. Clark’s interest was mining, and he recognized how he could tap into the bonanza strikes in Tonopah and Goldfield and the potential of older mines in Southern Nevada if he connected them by railroad to major markets. William Clark’s younger brother, J. Ross Clark, who had settled in the burgeoning city of Los Angeles, had invested successfully in the California sugar beet industry. He was very aware of the potential for Southern California produce in the eastern markets and for Los Angeles as a major Pacific port for the export of raw materials. 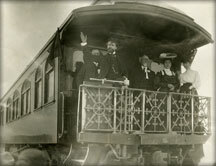 The Clarks also saw the importance of Salt Lake City—under the entrepreneurial leadership of the Mormon Church—as an important entrepôt, a connection with transcontinental railroads, and a leader in pushing the development of mining and agriculture in southern Utah and southeastern Nevada. For both Clark and Harriman the value of the route across Nevada was freight: ore from the mines, supplies to the mining camps and towns, and California fruit to Salt Lake and the eastern markets. The ambitions of Clark and Harriman clashed in Nevada. To counter Clark’s new railroad, Harriman had the Oregon Short Line push its line south into Nevada, eventually to meet the Union Pacific in California. But the Clark brothers pushed just as hard and just as fast until there were two competing grading teams racing against each through the narrow Meadow Valley wash. Throwing up physical and legal barricades against each other, the two sides quickly reached a stalemate. More important than the bottleneck in Nevada, Harriman and the Union Pacific could easily block Clark’s access to Salt Lake City, but had no way into California from Nevada. A compromise was necessary and the two great egos reached an agreement: Harriman acquired half of Clark’s railroad and let Clark finish the line, while effectively absorbing the Salt Lake Route into the Union Pacific System. Both men got what they most wanted: Clark, publicity and image, and Harriman, control and a west coast terminus. Who controlled the power and how were decisions made in early Las Vegas? The ranches in the Las Vegas Valley quite naturally grew around the natural springs: the Cottonwood Spring, the Las Vegas Spring, and the small springs that watered what became known as the Kiel ranch. The land watered by the springs supported fruit orchards, grapes, and a variety of vegetables. Oats, barley and wheat crops would alternate with beans, melons, squash, cabbage, beets, onions, and potatoes. Livestock roamed freely on the grasslands, some corralled at night by ranch hands who were often local Native Americans. Manufactured goods and supplies had to be freighted in from California or Utah. The original owner of the ranch was a miner, O.D. Gass, who had gone west from his home in Ohio to the gold fields of California in 1849. He knocked around from mining camp to mining camp until he landed in Eldorado Canyon south of Las Vegas. In 1865 he and two partners moved up to the old Mormon fort, rebuilt the building, plowed the fields, and opened a store for travelers. His daybooks, which have survived and are still kept at the Old Fort, record the daily life of ranching, herding the cattle, planting, weeding, harvesting, laying up, storing, marketing produce, building and mending fences and ditches, and running a hostelry for the steady stream of travelers and prospectors on their way to the mines or to Southern California and back. The Stewarts continued running the ranch in much the same way as Gass had done, the store and hostelry business growing as traffic along the roads increased. 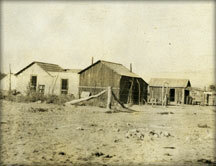 With the mining boom to the north and south, the ranch became a crossroads of wagon trails. The ranch provided the Stewarts with steady income, but Helen, who took over after her husband was murdered at the neighboring Kiel Ranch, saw that the future was not in ranching or farming. When it became evident that a railroad was certain to cross the Las Vegas Valley on its course to California, the location of the ranch and its control of the largest source of water in the Valley made it prime real estate. Helen Stewart, a remarkably shrewd and intelligent business woman, saw at once that she was the only seller in a seller’s market when the railroads came to call. First she bargained with the Oregon Short Line, one of the roads competing for the grade through Southern Nevada, then drove a hard bargain and sold what by then was a pretty rundown property to Senator William Clark for his San Pedro, Los Angeles, and Salt Lake Railroad. The ranch continued as a ranch for many years after the little depot town grew out of its tents, and in the late 1920s some even considered turning it into a model farm and showpiece of scientific agriculture. But the future of the valley was not to be farming or ranching. How important was the geographic theme of movement to the settlement of Las Vegas? At the mid-way point between Salt Lake and Los Angeles, Las Vegas was an obvious site for the railroad to water and do maintenance on its trains, and at least initially, that was essentially all the Clarks saw for Las Vegas. One can easily read in railroad correspondence J. Ross Clark’s lack of enthusiasm for “booming” a town at Las Vegas, because he feared that land would fall into the hands of speculators. In some ways his fears were justified, as evidenced by the actions of local surveyor J.T. McWilliams, who tried to preempt the railroad by laying out his own townsite. And so the railroad laid out its town, established the Las Vegas Land and Water Company to manage it and the rest of its property including the ranch, and sold off the lots, mostly to real estate speculators from California, at the now famous auction. With the crossroads of a number of established wagon trails leading to the mining camps scattered around the surrounding mountains and further north, Las Vegas was a natural freighting center. As a town dependent on the wealth and freight of the regional mining districts, Las Vegas almost went the way of the other mining towns of Southern Nevada. Its springs and wells only supported limited agriculture—mostly small orchards—and scattered ranching, despite efforts to promote the valley as a new California. But as a rail center on a major rail line, with machine shops, an ice house for refrigerating fruit and produce being shipped from California, and a large number of railway employees and their families, Las Vegas survived. Its economic dependence on the Union Pacific would cause tensions manifested in strong local support of national railroad strikes and strikers, and periodic eruptions of violence against the railroad. The railroad strike of 1922 occurred amid the lingering post-war recession, and took an ugly turn in Las Vegas when it was rumored that the railroad intended to move its machine shops to Caliente as a reaction to the town’s mounting hostility. Walter R. Bracken, Las Vegas agent for the Union Pacific and VP of the LV Land & Water Co., complained to the general manager of the Union Pacific of “the writings of the Bolsheviki editor” of the Las Vegas Review, an anti-railroad supporter of the railroad strike. In a series of cipher telegrams, railroad officials desperately arranged for trucks to carry food and ammunition from Los Angeles or Utah to strikebreakers in Las Vegas while negotiating with the governor, state police, and local officials about protecting railroad property and employees from the strikers and hostile townspeople. © 2009 University of Nevada-Las Vegas. All rights reserved.